Hope everybody had a nice weekend. We too had a very nice one. As usual after giving babies to hubby to take care I cooked and baked some bread. March is here and in India it is time of year end exams, my two nieces are going to take 10th exam this year. When we call them they say they are studying, we know only after result come. Hope that they do well! Summer heat is also started showing up there. Here in US it is really hard to believe that it is March. Still cold and today the Houston weather is really windy; around 50 apartments got burned down due to a three alarm fire as a result of high wind. Firefighters did an amazing job to get the fire under control, but it is really sad that lot of people lost everything in a single day. As it shows that Mother Nature does things according to her will, and nobody has any voice on that. 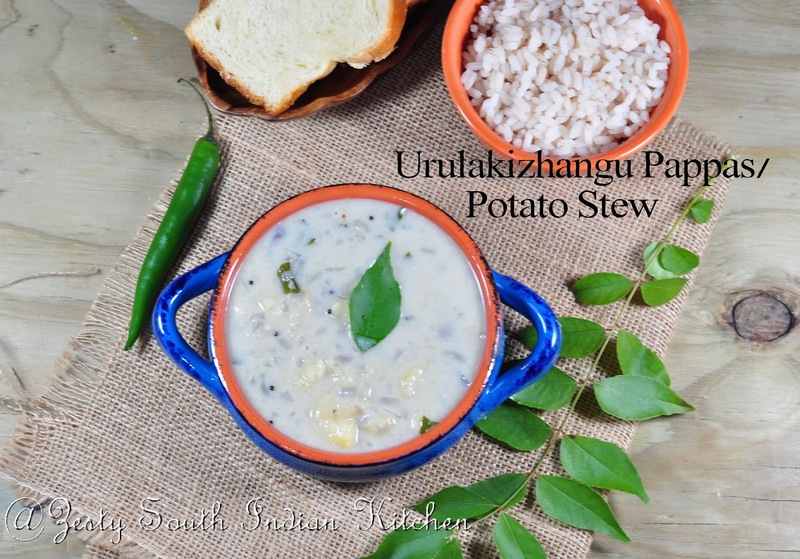 Urulakizhangu ishtu/potato stew is common breakfast side dish in my home town, Kerala, Southern India. It is usually served with appam a fermented pancake with yeast, and I love it. But I didn’t see them in any Sadya/ Feast recipes which I attended and mom never made it. 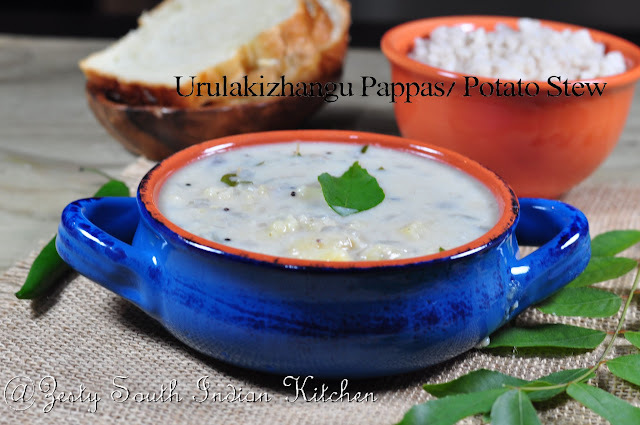 But I came to know about this Urulakizhangu pappas/ potato stew from a television show about Aranmula Valla Sadya prepared in the temple kitchen tat Aranmula Parthasarathy Swamy Temple. It is located in Village Aranmula near Chenganur, Kerala, India. Aranmula valla sadya is feast organized on Ashtamirohoni (August-September) day. During Valla Sadhya, Lord Krishna, the main deity worshipped in the temple, will come to take the offerings from people. The legend is that in a Valla Sadya all dishes asked for must be given to the people in order to please the Lord. It is usually done as offering for things to get done well. It is a giant feast and about 60 dishes will be served. Earlier I tried one recipe from the valla sadya, varthua erissery/Raw Banana and Black Eyed Peas in Roasted Coconut Sauce. I am planning to try few other recipes. I will try as time permits. This is recipe adapted from Flavors of India, Kairali Tv travelogue by Lakshmi Nair. I noted down from the chef in that You Tube clip as he is explaining it to the host. He didn’t give any quantities, so quantities mentioned here is my contribution. Here goes the recipe. It differs from the normal potato stew which my amma used to make. Usually potato, ginger and onion and are cooked with green chilies in diluted coconut milk until potato is done and then finally add thick coconut milk, coconut oil and curry leaves, there will be no seasoning. 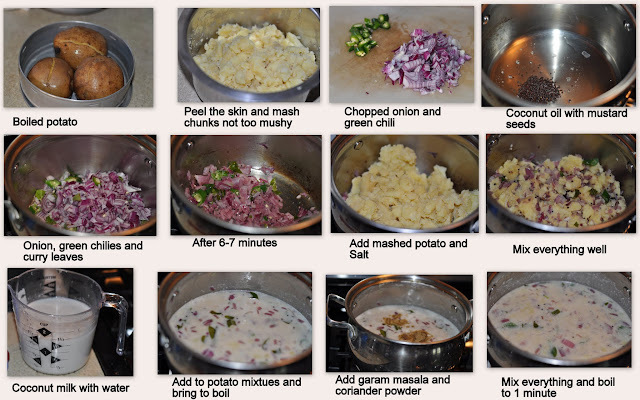 However in the valla sadhya special recipe they cook potato separately and mash them into chunks and set aside. Fry the onion, green chili, curry leaves and mustard seeds and mix this mashed chunk potato and then add coconut milk and bring to boil. While coconut milk boiling add garam masala powder and coriander powder to finish the curry. I made this curry like this. If you love coconut milk and potato, or fan of Thai cuisineyou are going to love this. In a bowl mix coconut milk and water and set aside. Combine mashed potato, salt along with onion, chili and curry leaves mixture. Heat once again this mixture with coconut milk mixture when it starts boiling add garam masala powder and coriander powder. Mix well once again and switch off the flame. Enjoy with rice, appam, chapathi or your choice. I am linking this Hearth and Soul Blog Hop hosted here. hmmmmmmmmmmmmmmmm yum yum lip smacking and awesome potato stew. Real flavored and inviting dish to me…. Wow ! Love the bright blue dish and yes food looks good too! Potato stew looks so tasty and healthy. yummy and healthy curry. Wonderful presentation Swathi. Looks yummy!! Wonderful snaps and lovely presentation!! droolworthy lip smacking with an awesome presentation. lovely pictures of a yummy dish with clear write up. real good post Swathi. delicious stew. do visit my space to. Too tempting stew dear,looks very delicious!! Looks yum. I am sure Lord Krishana will love this one too. Stew looks very delicious..perfect with steaming rice..
Adipoli curry,looks so yummy and love the presentation,will surely try this. Lovely stew, perfect for the weather you have there!! 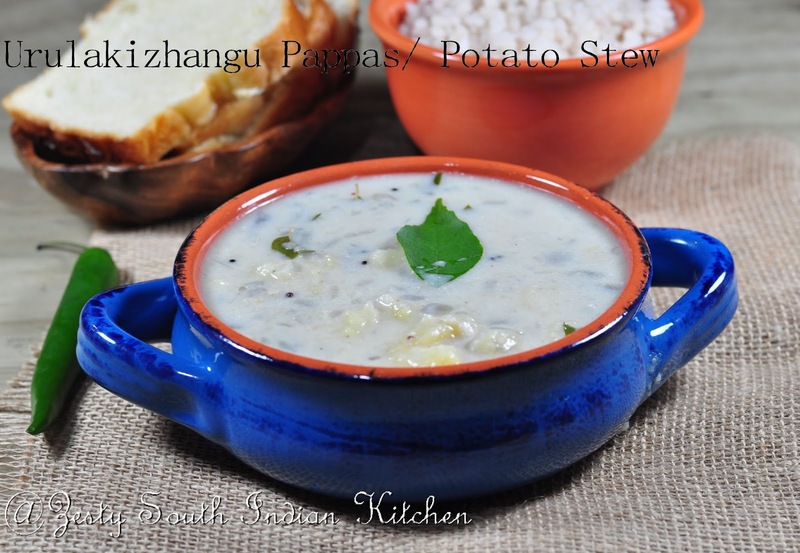 Yummy stew – am going to try it the next time I make idiappam! Yumm….very tasty and lip smacking dish. wow…the dish looks so drooolworthy & delicious..
delicious preparation.. although this is new to me… can imagine its delicious taste!!! This looks like a tasty stew Swathi! A very interesting recipe with a wealth of flavors. Lovely post Swathi; bookmarked the recipe. We make ours the way you described but the mashing part would lend this one to a hearty soup too. I noticed that they have the tempering with mustard seeds, garam masala and coriander powder here unlike our ishtu. More like the Kurma/Qurma. I like such mild flavored dishes. This recipe is new to me. yummy and tasty.. pic looks very inviting..
wow nice stew we eat this with idiyapam and appam I just love it. Your recipe is way nicer must try it. Nice stew , love this with aapam. Such a delicious and comforting potato stew! I love hearing the story behind it Swathi!